This will be a short review on Hidamari Sketch x SP, the seventh installment in the Hidamari Sketch series. What is a nutbladder? A profound question that has shaken both the very foundation of metaphysics and psychoanalysis. After much discourse on the issue, the Japanese Board of Mental Health and Neurology deemed further discussion on the topic "too intense." Many have taken the debate into their own hands, widely spreading the highly controversial topic onto various image boards, with very positive results. Thanks to these anonymous scientists stationed throughout the globe, much development has recently been made in studying the nutbladder. While many of it's properties and purposes remain a mystery, certain things can be discerned about the nutbladder thanks to these kind anonymous submitters. 1. The nutbladder is a state of mind. 2. The nutbladder is very fragile. 3. The nutbladder, when exposed to Hidamari Sketch, is prone to bursting. A notable aspect of the nutbladder is the fact that a mental state can "burst." It is not currently known why Hidamari Sketch invokes the nutbladder and how a mental state can do such a thing, but a fringe group of scientific minds have surmised that the reason behind this is the constant mix of colors and high-pitched voices. Subjecting the human body to such unbelievably happy images, whilst barraging it with audio par excellence has been noted to directly affect the nutbladder. This in turn provokes further questions. Why does the nutbladder react so extremely to Hidamari Sketch? Is bursting your nutbladder a positive trait? Why is Yuno so adorable? We hope to continue this investigation further upon the release of Hidamari Sketch 4th Season, but until then we can only theorize conclusions. Thank you for all your help, and please continue researching this phenomenon by watching Hidamari Sketch x SP! Note: If this review was over your head, go check out Hidamari Sketch and hopefully you'll begin to grasp the concept. 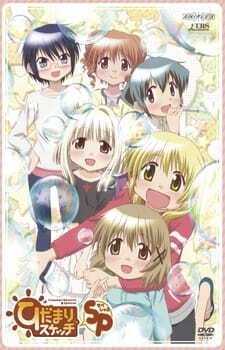 Hidamari Sketch x SP is a two episode special of the still-continuing Hidamari Sketch series. Just like every season before this one, these specials do not have a big plot or any big drama and instead focus on the daily lives of 6 art school students who live in the same dormitory. If you aren't a fan of slice of life shows where nothing happens (shows like Lucky Star or K-ON) then these specials (and the series) aren't for you. If you are interested in this, it is highly recommended that you have watched the first 3 seasons of Hidamari Sketch before watching these specials in order to get properly introduced to the characters and the general format and setting of the series. For those who have seen the past 3 seasons and have at least liked the series a whole, I would definitley recommend seeing these specials. The art is great and colorful as always and SHAFT continues to use their quirky animation style. If you enjoy seeing Yuno's cute naivety, Miyako's energetic craziness, Hiro's girly worries, Sae's voice of reason, Nazuna's shyness, Nori's fun sarcasm or just the interaction between the 6 you have no reason NOT to watch these specials. Yoshinoya, the quirky childish teacher gets a little screentime for those who like her as well.